Upper: Engineered mesh, fused synthetic. Midsole: Everun topsole over an EVA midsole with a firmer medial post. 8 mm heel offset. The Guide 10 leaves all the stitching and crash pad behind, taking to a no-sew upper and a cleaner midsole design instead. There are some changes in the shoe's ride and fit quality, but nothing drastic. The Saucony Guide might live in the shadow of the more popular Saucony Ride, but Christmas always comes to the Guide first. Like literally. 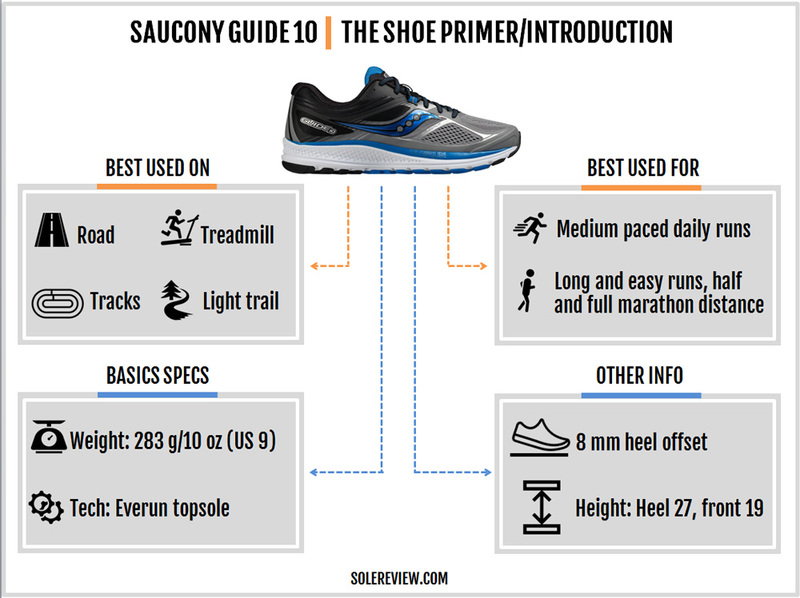 When the Everun topsole fitted Guide 9 was released around this time in 2015, the Ride 8 – its neutral counterpart – was still rocking the older Powergrid midsole. And it’s that time of the year again. 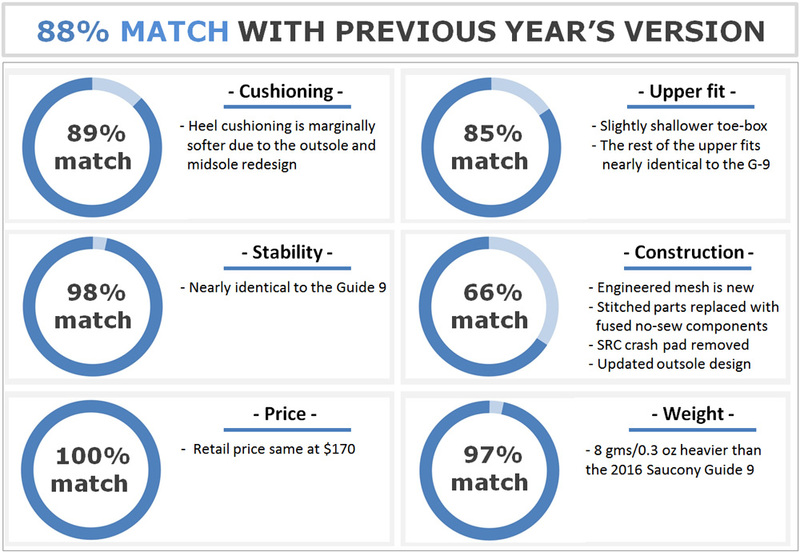 The new Guide 10 gets a new set of upper, midsole and outsole, but we’ll have to wait until Spring 2017 to see the Ride 10 receive its annual updates. Some things stay the same on the Guide 10. The Everun ‘topsole’ below the insole hasn’t changed, and the outsole carries over the distinctive ‘Chevron’ patterned forefoot. Having said that, know that there’s plenty of newness on the G-10. The upper design is refreshed, the midsole construction receives an overhaul, and the outsole gets its share of tweakery too. As the result of these updates, there’s a difference in how the Guide 10 fits and rides. 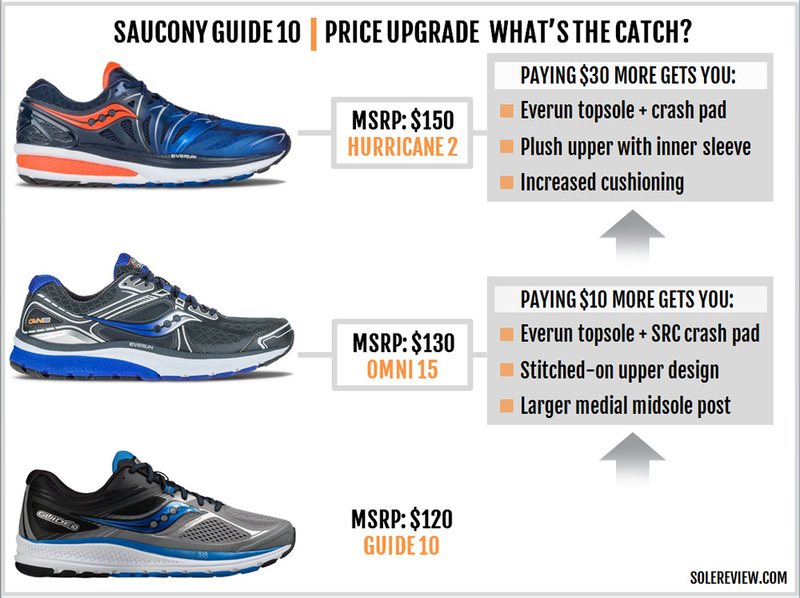 Though the changes aren’t radical, they will be noticed by runners who trade in their Guide 9’s for the latest version. 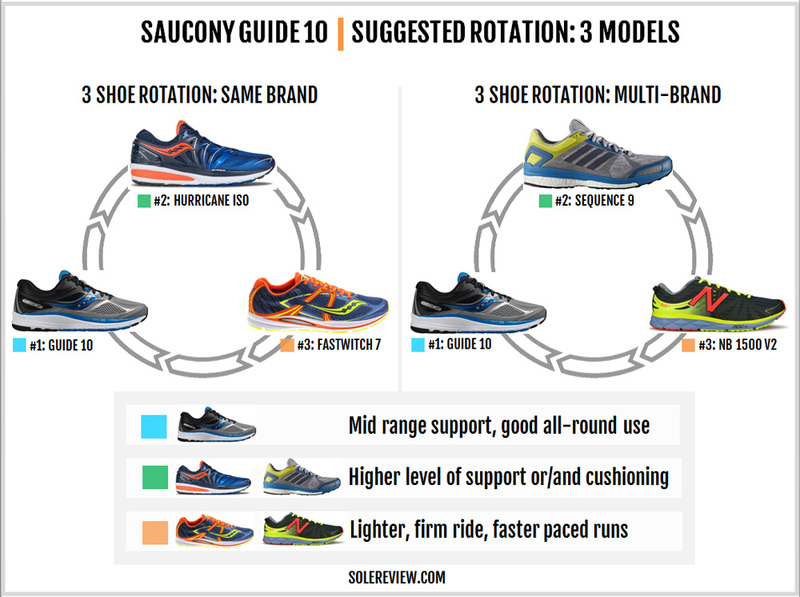 The Saucony Guide is a familiar name for anyone who has experience shopping for stability shoes. It is the ‘support’ version of the neutral Ride 9, differentiated by a firmer ride and a medial post (a harder piece of foam) integrated into the inner midsole. Depending on the brand, you’ll be served multiple variants of the same concept. The Asics GT 2000 4 (now going on 2000-5) packages a medial post into a softer ride, whereas shoes such as the Brooks Adrenaline GTS 17 and New Balance Vongo are firmer variants. The Nike Structure 20 pops in a forefoot Zoom bag to make the front-end responsive, and the Wave Inspire 13’s esoteric ride character runs tangentially to the rest of the flock. The Guide 10 blends in a firm, supportive ride with a touch of responsiveness, courtesy of the thin Everun layer called the topsole. One immediately obvious aspect of the Guide 10’s upper is its decreased reliance on stitched components. While that was partly true for the Guide 9 as well, the new Guide replaces all stitched patterns with no-sew ones. 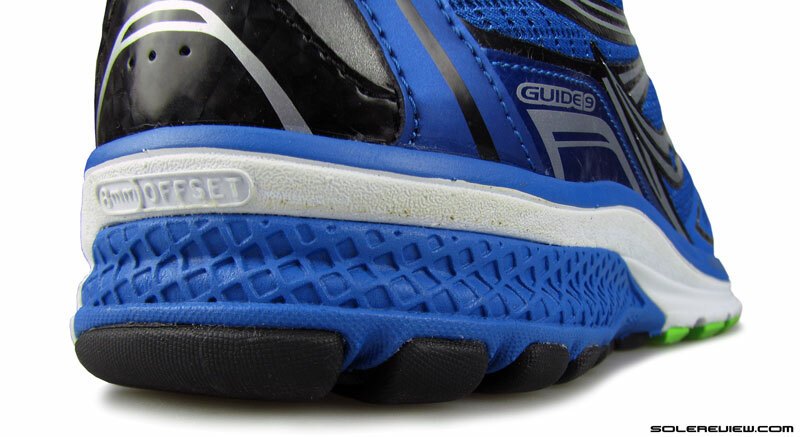 On the Guide 9, the fused Flexfilm layers were supplemented with a stitched toe-bumper, lacing eyestay and mid/rearfoot overlays. None of that exists on the Guide 10. Right from the toe-bumper to the heel, the entire package is a no-sew setup. Certain elements haven’t changed from the Guide 9, and that would be the plushly padded heel collar and a sleeve-free tongue construction. The heel and tongue lining use the identical ‘Run-dry’ fabric, a proven material with a soft hand-feel. The laces are flat and are a semi-elastic kind. There’s a minor change over the lacing panel; there’s a pair of fabric speed-loops on the center. This single row of loops replaces the regular eyelet pair of the Guide 9. The dual loops are stitched into the upper, and provide better cinching in that area. The engineered mesh is now the de facto industry standard, and the Guide 10 adopts it too. The G-9 had a regular spacer mesh over its forefoot. The G-10’s upper transitions to an engineered mesh, which has vented areas on the top and the sides, with a denser weave and Flexfilm layers covering the rest. A notable change would be the medial midfoot, where Saucony substitutes the G-9’s stitched panel and Saucony Creek logo with stitch-free layering and a large ‘Saucony’ text call-out. There are some other (new) design elements too, such as the molded mesh near the heel collar. So – with all the updates, the question is: does the fit character of the Guide 10 change? Most of the Guide 10’s upper fits like the Guide 9, save for the toe-box. Replacing the stitched-over toe bumper with a molded one affects the toe-box fit to some extent. More to follow during our upper fit section. There’s a new midsole and outsole under the Guide 10’s upper. The insides are the same, though. 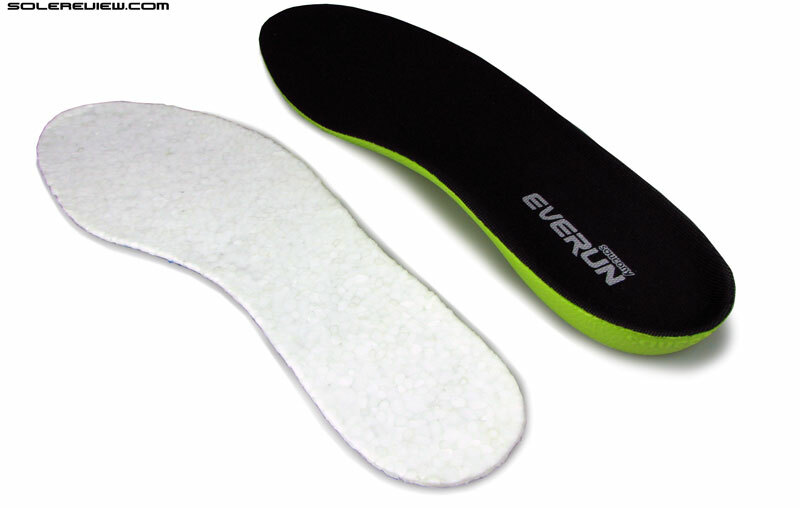 There’s a removable insole made of thick EVA foam above a thin layer of Everun. The rest of the midsole is solid EVA foam with a harder medial post, which is different than how the Guide 9 was put together. Here’s a picture of the G-9’s midsole. You’ll notice that the rearfoot SRC crash pad has disappeared on the G-10. Except for the harder medial post, the midsole is a single piece of EVA foam. To compensate for the crash pad’s removal, the lateral midsole has a deeper groove running through it. The upper forefoot is painted, so don’t be misled – the lateral midsole is a single piece unit. 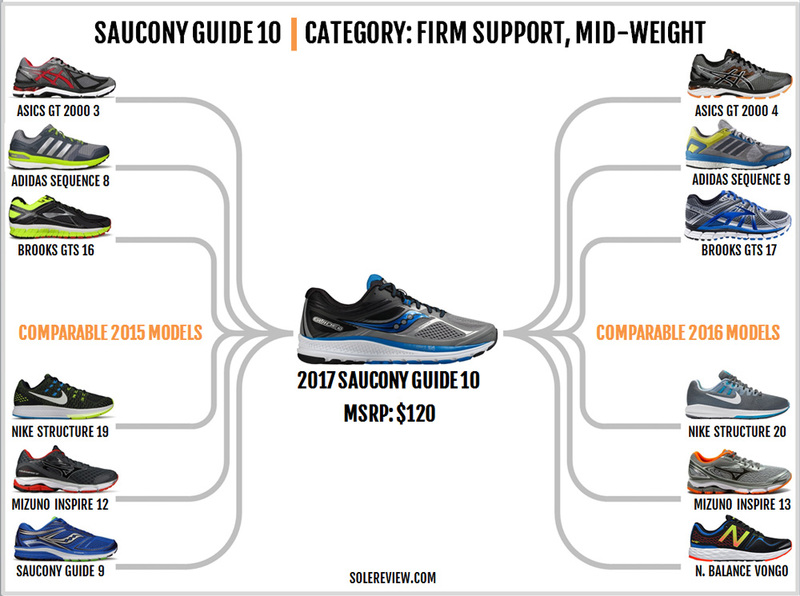 On the inner side, there’s a harder medial post – a design constant on the Saucony Guide. 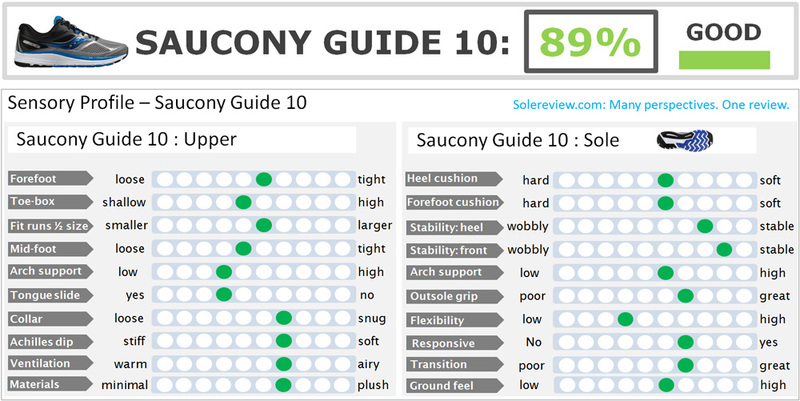 The current outsole design theme for Saucony running shoes is the Chevron-lugged forefoot, which is what you get on the Guide 10 too. The front and rear have different rubber compounds; the forefoot is made of soft blown rubber while the heel is underlaid with a harder type of rubber. Both the Guide 9 and 10 share a similar forefoot design, but the G-10’s mid and rearfoot receives a few updates. On the medial (arch) side, the outsole rubber loses most of the flex grooves which the G-9 had. On the new model, there’s a solid piece of rubber under the medial post. On the other hand, the lateral (outer) midsole gets the softer treatment. The blown rubber extends further towards the midfoot, and the heel crash pad is separated from the rest of the outsole by a flex groove. So the heel outsole is completely decoupled on the Guide 10, which wasn’t the case with the G-9. 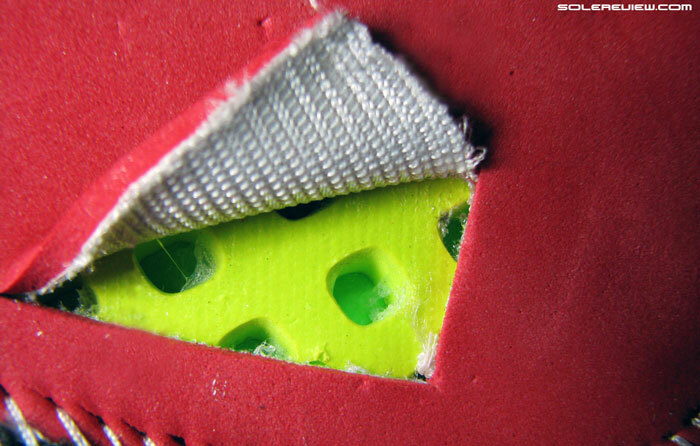 The exposed section of midsole foam under the heel is deeper than the Guide 9. 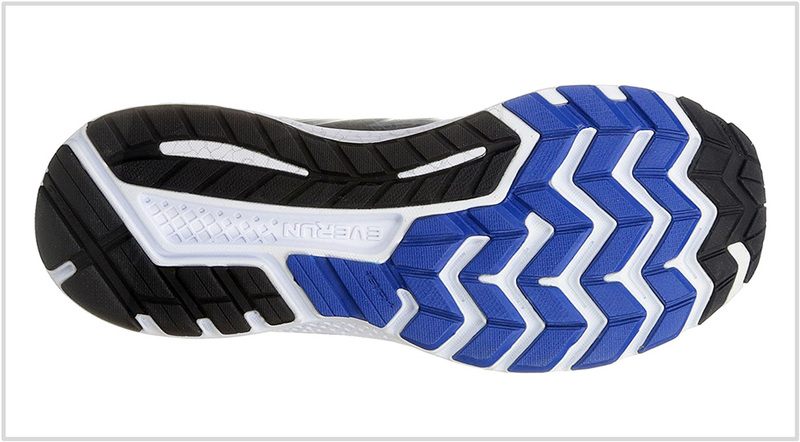 This, when combined with the outsole and the midsole change, impacts the Guide ride behavior. At an overall level, the outsole retains the full-contact layout and a wide forefoot flare which has been appreciated by Saucony loyalists. 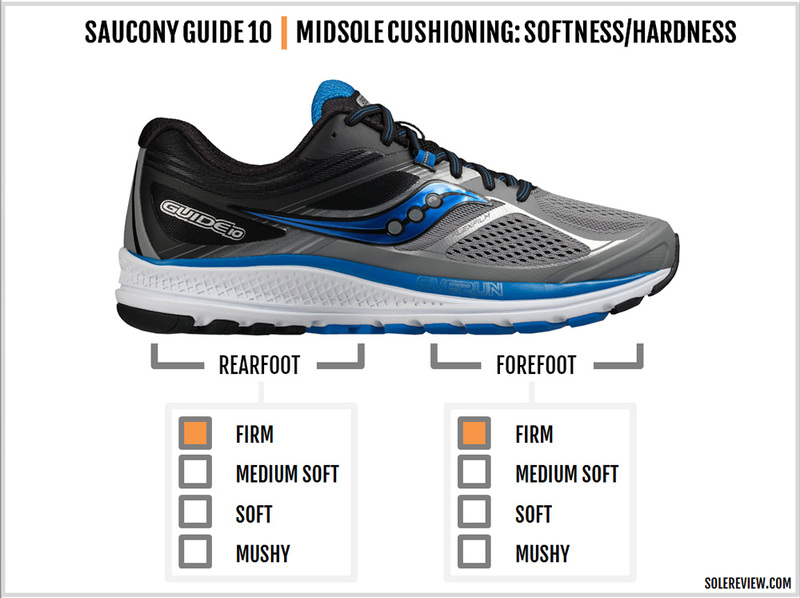 Based on the update cadence, the Saucony Ride follows in the Guide’s footsteps. 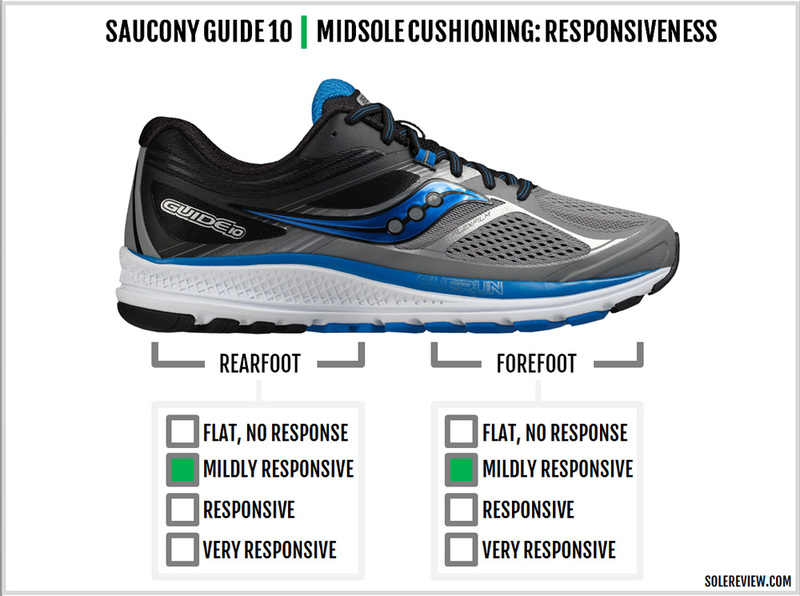 This should mean that the Saucony Ride 10 should come with a single piece midsole and an updated outsole. We’ll have to wait till next summer to see if this assumption holds. If the latest Triumph ISO 3’s redesign is a reliable yardstick, then the Ride 10’s design should head in a similar direction too. 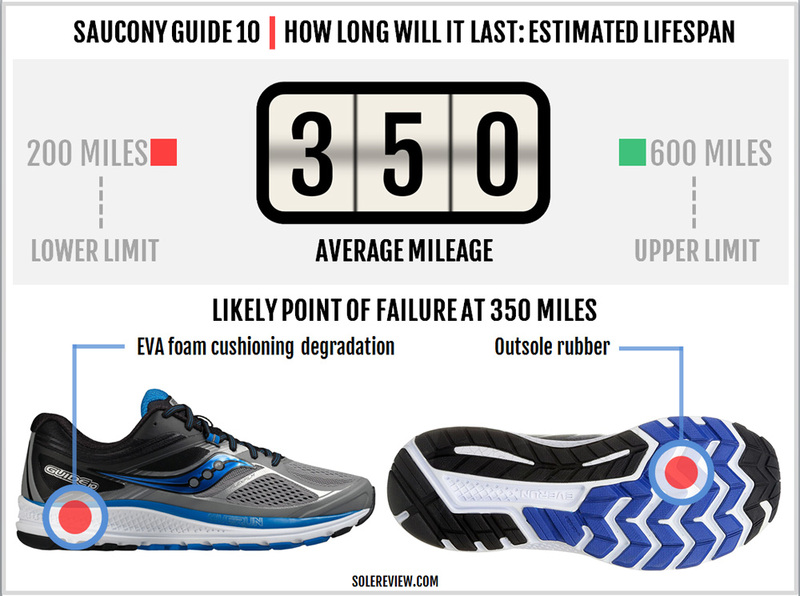 We estimated the Ride 9’s median lifespan to be 350 miles, and we say the same goes for the Guide 10. The softer forefoot rubber should be the first area to take the brunt, followed by a gradual degradation of midsole cushioning. Like adidas Boost, the Everun topsole is very durable. But then, the rest of the midsole is regular EVA foam, which makes it eventually susceptible to losing its cushioning properties. The Guide 10 fits well in all areas. The padded heel with its soft lining wraps around the foot in comfort with a reassuring grip, and the padded tongue offers adequate insulation from lacing pressure. There’s a mild tongue slide due to the lack of a sleeve, but nothing which upsets the fit. The toe-box height is adequate, but it is shallow when compared to the Guide 9. The molded toe-bumper lowers the ceiling relative to the stitched-bumper design of the G-9. From an industry average perspective, the toe-box isn’t shallow. It certainly has more vertical room than shoes such as the Nike Pegasus. 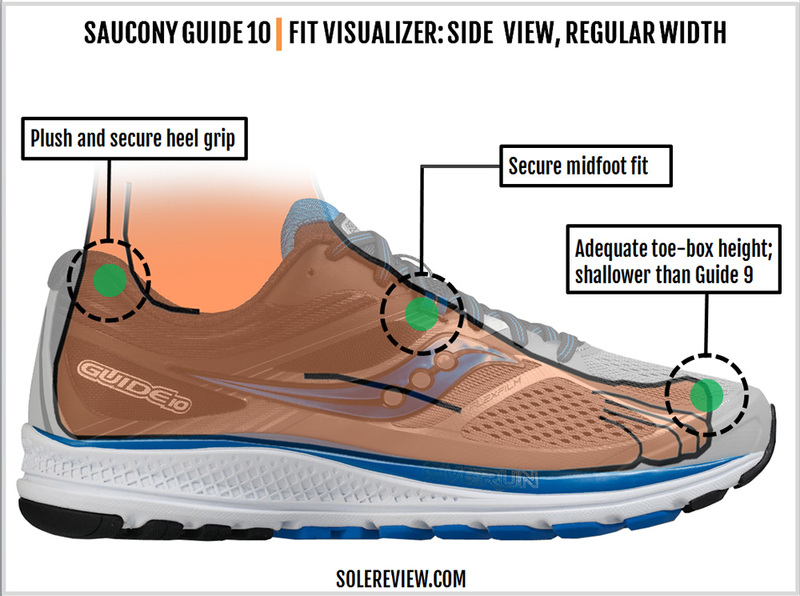 The forefoot is snug, which is typical of the Saucony Guide and Ride. It is not tight, but if you want more splay room, you’ll need to get the wide (2E) version. Sizing fits true to size. In the absence of drastic fit changes, there are no sizing quirks on the Guide 10. Historically speaking, the Guide has never been a soft shoe. Even on the Powergrid infused version, the midsole only offered a superficial layer of softness. That same is true for the Guide 10, which remains a firm shoe. The main midsole below the Everun topsole and the EVA insole has a firm quality. That said, the Guide 10’s rearfoot runs slightly softer than the 9. That would seem strange considering that the midsole doesn’t have a crash pad, but there are other design updates which cause this. A lot of this has to do with the outsole design. The deeper foam cavity under the heel creates an increased trampoline effect, and the decoupled crash pad design allows for a greater range of movement. In cushioning terms, the incremental movement translates into more softness. Forefoot strikers will not sense the change in ride character, for little has been updated in the front. 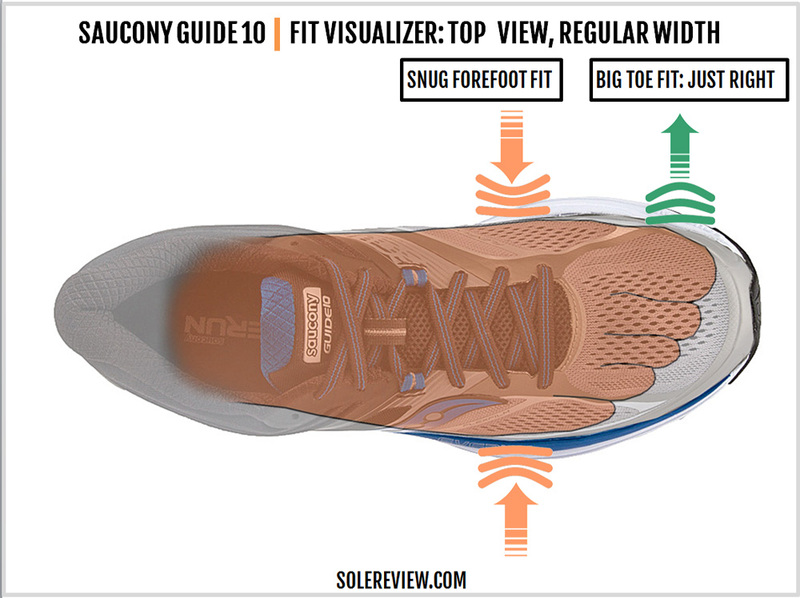 The Everun topsole is Saucony’s marketing plug for the Guide, but remember that’s exactly what it is – a topsole. Putting a thin, layer of responsive material under a foam insole does not produce a lot of responsiveness. 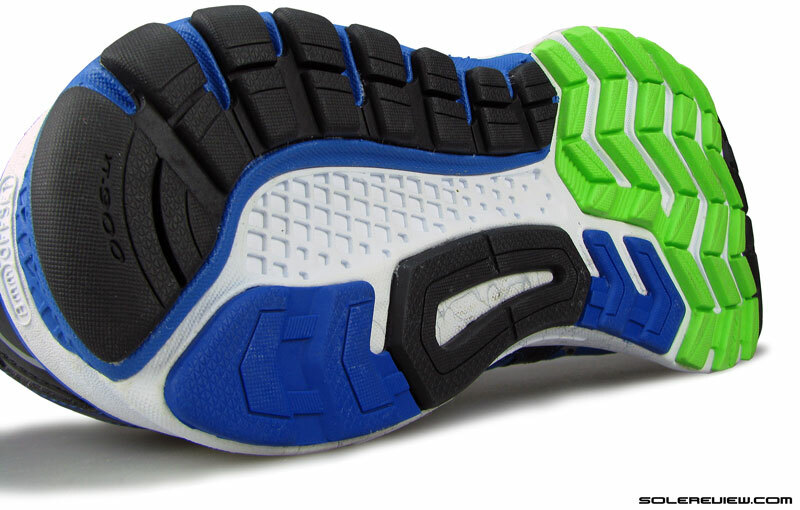 However, the Guide’s firm midsole allows the topsole to perform better than the softer Ride 9. Compression in shoe midsoles happens on the principle of least resistance. Since the Everun topsole and insole is much softer than the midsole, runners will be able to fully tap into the topsole’s compression properties. The deeper under-heel cavity will also deliver a certain degree of rebound as it compresses and springs back under weight loading. Truth be told, we see the disappearance of the Guide 9’s lateral crash pad as a good thing for stability. 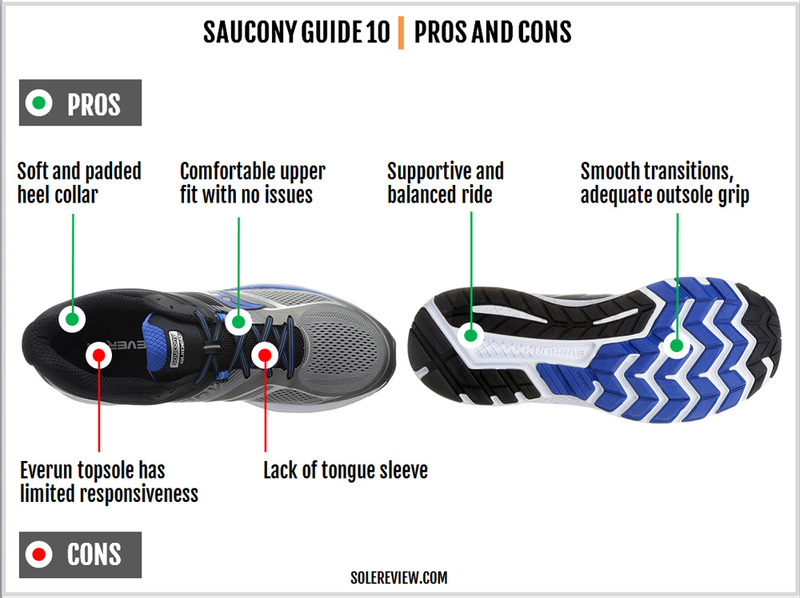 The Guide 10’s single piece (except for the medial post) midsole approach reduces outward bias and centers the ride. 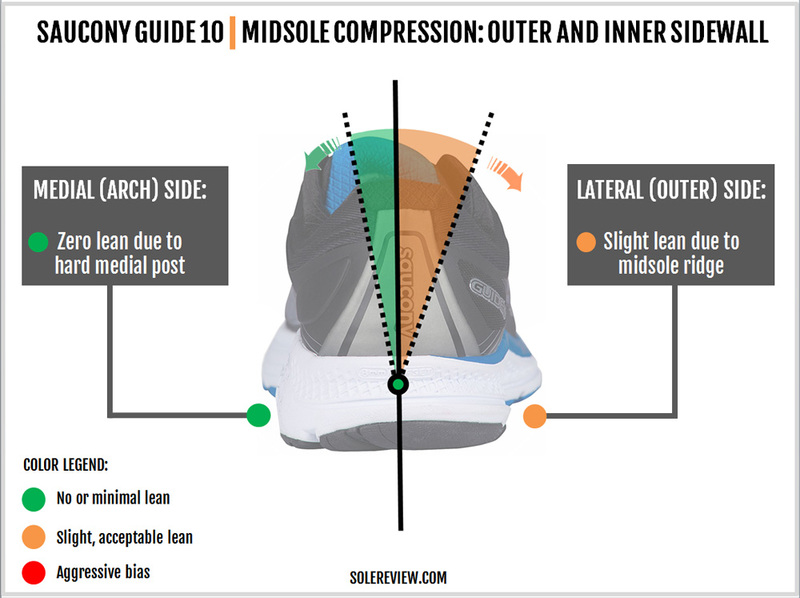 Even with the firmer medial post, the medial and lateral midsole feels very balanced; the Guide 10 has a near-neutral like ride behavior. 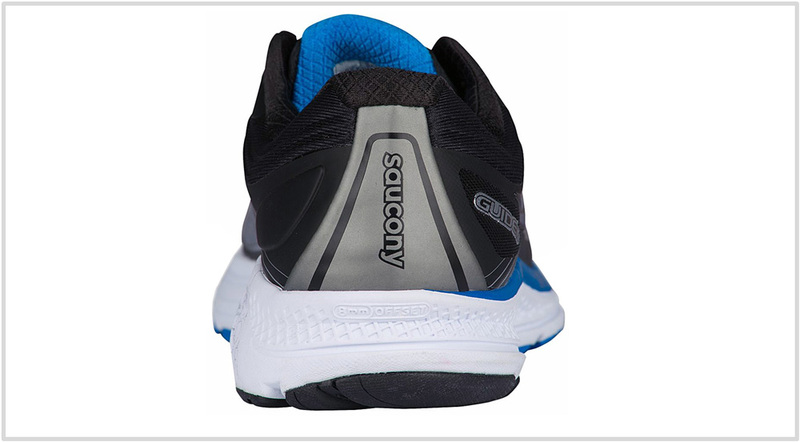 Saucony’s characteristic wide forefoot flare makes the ride planted, and the full contact outsole delivers connected transitions. With its well-balanced ride quality and consistent upper fit, the Guide 10 leaves little margin for complaints. The tongue could have come with a sleeve, but that’s just about it. 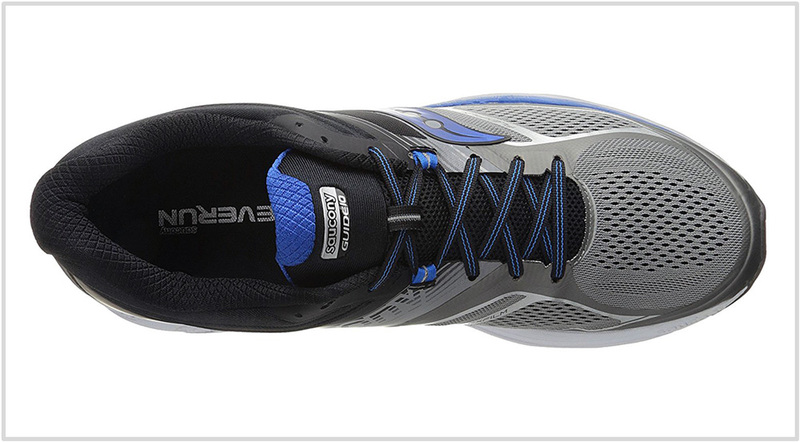 As a stand-alone shoe, the Everun topsole is a welcome design feature. But if you compare the Guide 10 against the likes of the adidas Sequence Boost, then the Everun seems akin to a trial version of a similarly priced, fully unlocked software. Let’s say that you like the Guide 10, but wanted two more shoes – one with more cushioning, and a lightweight model with a fast ride. 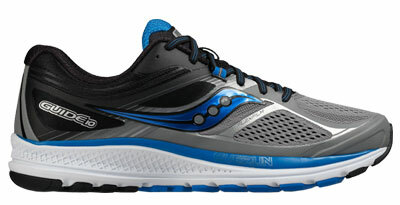 Luckily, the Saucony running assortment offers ideal rotational companions. On the more cushioned end of the scale, the Hurricane ISO complements the Guide. There’s more Everun, and you also get an extra dose of upper plushness. For race-days or track workouts, the Fastwitch 7 is a suitable alternative. Both the Hurricane and Fastwitch come with a firmer medial post, in case that happens to be a must-have for you. On paper, the $130 adidas Sequence 9 is on the same level as the Guide. But you have to know that the Sequence offers a sizable Boost foam midsole, which is basically made of the same material as Everun. So if you wanted a slightly more cushioned and responsive ride, then you should consider the Sequence 9. The ever-excellent New Balance 1500 v2 is solereview’s choice of a ‘fast’ shoe. 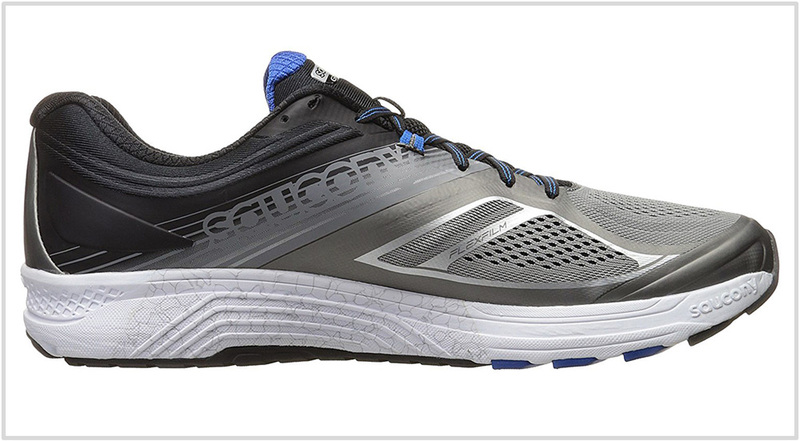 Perfect upper fit, and a superlative ride quality which balances ground feel with cushioning. Plenty to talk about here, as the Guide 10 overhauls the G-9’s upper, midsole and outsole. The rearfoot cushioning gets a bump up in softness because of the redesigned outsole and midsole. On the upper, the stitched components have been replaced with no-sew ones. There’s little change in the upper fit quality, save for the slightly shallower toe-box. With the lateral crash pad gone, the midsole feels more centered – which is a good thing. The price hasn’t changed, but the weight has. For a US size 9, the Guide 10 is 8 grams or 0.3 ounces heavier than the Guide 9. If you’re wondering what other medial-posted Saucony options are available, fret not. Solereview is here to give you a quick low-down. At a $10 MSRP upcharge over the Guide, you get the Omni 15. Consider the Omni as a Guide 9 of sorts with a larger medial post. The upper has a stitched-over construction like the last year’s G-9, and it also has the SRC crash pad fitted into the lateral midsole. The Omni 15’s medial post is much larger than both the Guide and Hurricane. For a $150 MSRP, the Hurricane ISO offers increased cushioning over the Guide 10. 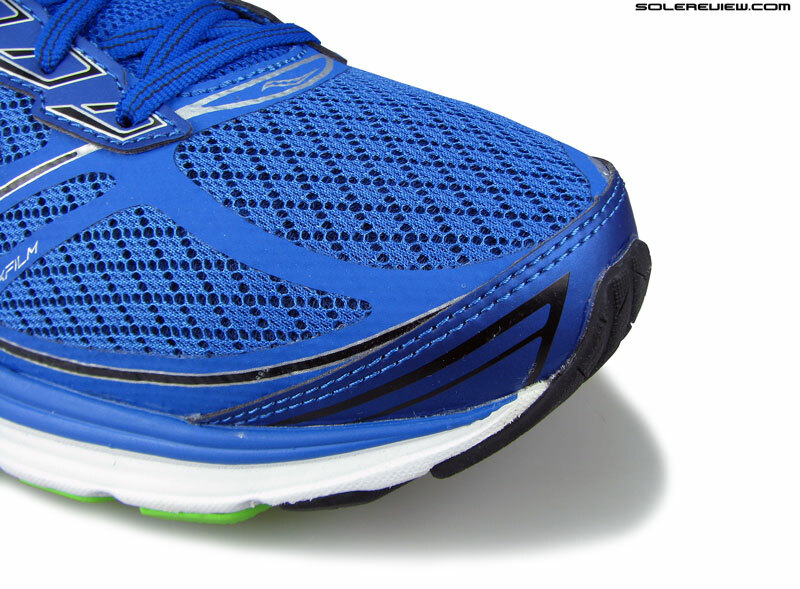 In addition to the Everun topsole, the heel has an Everun landing zone. Wait, what about the Saucony Redeemer? Isn’t that a vertical upgrade? Solereview views the Redeemer in a different category than the Hurricane and Guide. With its humongous medial post and ultra-wide outsole footprint, the Redeemer falls in the Brooks Beast 16/Asics Foundation territory.